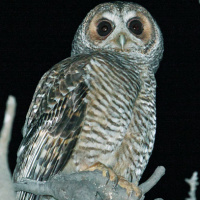 The Rufous-legged Owl is a medium-sized owl with a rounded head and no ear-tufts. Typical calls - Altos de Lircay National Park, Chile. CC Lance A. M. Benner. Distribution: From south central Chile and southwest Argentina south to Tierra del Fuego. Also occurs on Chiloé Island. Status: Uncertain, possibly threatened locally. Original Description: King, Philip Parker (Rear Admiral). 1827. (The) Zoological Journal 3. (Zool. J.; Conducted by Thomas Bell, John George Children, James de Carle Sowerby, and GB Sowerby. 1824-1835 5 vols., 8vo): p. 426.